Sale $10 Plus Free Belt Holder and Window breaker End Cap with every Baton -while supplies last. 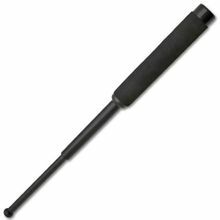 The 16 inch Expandable Baton is a great self defense weapon on several levels. This baton can be used in the open or closed position. In the open position you can reach out your outstretched hand to strike your opponent or keep a dog at bay. It can be used in countless ways to attack and defend. The foam handle grip allows you to securely retain your hold on the weapon even in hot, sweaty conditions. Opens with a quick snap of the wrist to a full 16 inches. Tap straight down on a hard surface to close to its 6.75 inch carrying size. Comes with tough nylon belt holster. Not Available in NY, MA, CA. You must be of at least 18 years of age to purchase this product. It is the buyers responsibility to check your local laws before buying.